You may not realize it, but many things can interfere with how your body makes breast milk. 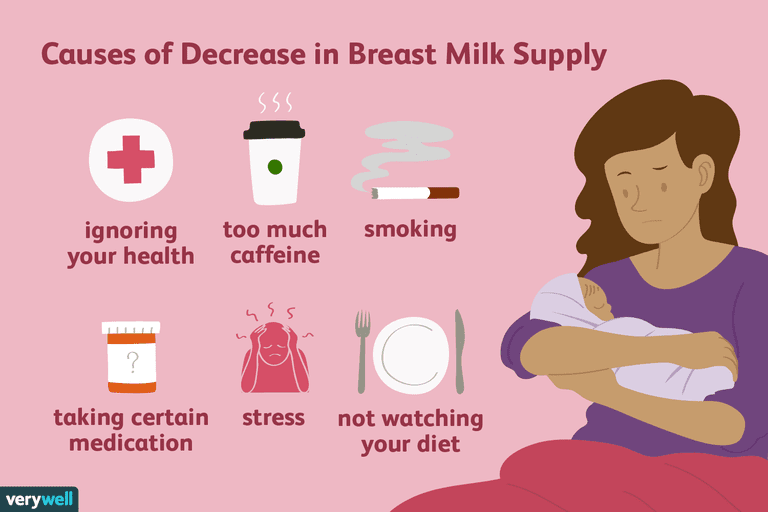 If you're breastfeeding and concerned about your milk production slowing down, take a look at these issues that can cause a decreasing breast milk supply. Health issues, diet, lifestyle choices, and medications can affect your breast milk supply. By understanding what can interfere with your milk supply, you may be able to make a few changes to your daily routine, turn it around, and begin increasing your milk production once again. Here are some of the things that lead to a reduction in breast milk and what you can do about it. Your health and the condition of your body and mind can affect the production of breast milk. When you're physically well, getting rest, and have a healthy support system, your body can focus its energy on making milk. But, if your body is out of balance because you have an untreated medical condition, you're exhausted, or under a lot of stress, you can see a decrease in your supply. Here are some of the health issues that affect milk production. Not Getting Enough Rest: Recovering from childbirth, the demands of motherhood, and breastfeeding a newborn can be exhausting. Postpartum fatigue and a lack of energy can interfere with breastfeeding, and it's one of the common causes of a low supply of breast milk. It might not be easy during the first few weeks, but it's very important that you get enough rest. Take a nap when the baby takes a nap. Breastfeed with your feet up or lying down. Ask your partner, family, and friends for help with older children and chores. They can also watch the baby for a little while so you can take a break and lie down. Ignoring Your Health: An infection or other health conditions such as low thyroid function (hypothyroidism) and anemia can cause your body to make less breast milk. Once you treat the cause, your body can focus on making breast milk again. If you suspect that your milk supply is low because of a health issue, see your doctor for an examination. If you have an infection, your doctor may need to prescribe an antibiotic. Your doctor can safely treat many health conditions while you're breastfeeding. Just make sure to tell him that you're breastfeeding before he prescribes any treatments. Stress: Physical, emotional, and psychological stress can reduce your supply of breast milk. If you're concerned about privacy while you're breastfeeding, you may feel self-conscious or embarrassed. These feelings can interfere with let-down. Other causes of stress such as anxiety, pain, financial difficulty, and relationship troubles can also add to a lower amount of breast milk. If you are in pain, take your pain medication as directed. If you do not have pain medication, ask your doctor if you can take Tylenol or Motrin. If you're uncomfortable breastfeeding around others, it's OK to take your baby away from visitors and go into another room to breastfeed. When you're feeling stressed, take some deep breaths. If you can safely walk away for a few minutes, take some time to clear your mind. Talk about your feelings to someone you trust. Becoming Pregnant Again: If you become pregnant again while you're still breastfeeding, the hormones of a new pregnancy are known to cause a decrease in your milk supply. There's not much you can do to increase your milk supply while you're pregnant. If the child you're breastfeeding is under a year old, you may have to supplement with infant formula to be sure he's getting all the nutrition he needs. Children over a year old who are getting more nutrition from solid foods may not require supplementation. You should talk to your baby's doctor about what your child needs. What you eat can affect your overall health and your milk supply. Certain herbs have a negative effect on milk production and some foods that can have a positive impact. Not Paying Attention to Your Diet: What a breastfeeding mother eats and how much water she drinks has not been shown to cause a significant decrease in the supply of breast milk. Moms all over the world can make enough breast milk for their babies even when their diet is limited. However, a healthy meal plan and adequate hydration are important for your overall health. If you are experiencing a lower breast milk supply, it certainly won't hurt to eat better and drink plenty of fluids during the day. Adding some breastfeeding superfoods to your daily diet can help boost your supply. Try oatmeal, almonds, chickpeas, and dark leafy greens which are nutritious and have properties that support breast milk production. Using Excessive Amounts of Herbs and Spices: Small amounts of any herb or spice should not cause an issue. You can continue to cook with bits of your favorite herbs and spices. However, when taken in large doses, some herbs can cause a decrease in your breast milk supply. Peppermint and sage are the most commonly associated with a decrease in breast milk. Women even use them to help dry up the milk during weaning. Keep this in mind if you enjoy menthol cough drops, breath mints, and peppermint candy on a regular basis. Other herbs to avoid in large doses include parsley, oregano, jasmine, and yarrow. Instead, try using some herbs that may help increase your supply such as fennel, alfalfa, garlic, and ginger. You don't have to give up all the things you love when you're breastfeeding. You can still have your morning coffee and even an alcoholic beverage on occasion. It's all about not overdoing it. Here are the lifestyle choices that interfere with breastfeeding. Too Much Caffeine: Soda, coffee, tea, and chocolate are okay in moderation. However, large amounts of caffeine can dehydrate your body and lower your production of breast milk. Too much caffeine can also affect your baby. Some of the caffeine will pass to your baby through your milk. It can build up in your child’s body causing irritability and sleep problems. If your baby is irritable and not breastfeeding well, it could have a negative effect on your supply. If you drink a lot of coffee or soda during the day, try to cut back to one or two a day. Try decaffeinated coffee or green tea in place of your afternoon coffee and sparkling water instead of soda. Smoking Cigarettes: Smoking can interfere with the release of oxytocin in your body. Oxytocin is the hormone that stimulates the let-down reflex. The let-down reflex releases the breast milk from the inside of your breasts and allows it to flow out of your body and into your baby's mouth. If your breast milk is not released, it will not drain out of your breasts and stimulate your body to produce more. It's best if you don't smoke, but if you do, you should never smoke near your baby. To help with let-down, try to avoid having a cigarette within two hours of breastfeeding. Try to quit, and if you need help talk to your doctor. Drinking Alcohol: Alcohol, like smoking, can get in the way of the let-down reflex. Alcohol may also change the flavor of your breast milk, causing your baby to breastfeed less. If your child breastfeeds less often, you will not make as much breast milk. Not only can it decrease your breast milk supply, but excess alcohol can affect your ability to tend to your child's needs. Alcohol also passes into your milk which can put your baby at risk for a developmental delay. An occasional drink is considered okay, but it is not advised to drink alcohol regularly while you're breastfeeding. Many medications are safe to take while you're breastfeeding. However, some are not. Some may even contribute to a low milk supply. So, you always want to check with your doctor or a pharmacist before taking medication including over-the-counter drugs. Taking Certain Medications: Some prescription drugs and over-the-counter medications can interfere with the let-down reflex and breast milk production. Cold, sinus, and allergy medications that contain a decongestant called pseudoephedrine such as Sudafed, Advil Cold and Sinus, or Claritin-D can help dry up a runny nose, but they can also help dry up your milk supply. Tell your doctor that you're breastfeeding before she prescribes any medication. Based on your symptoms, your doctor can recommend a safe product for you to use while your breastfeeding. Ask your doctor or a pharmacist before taking over-the-counter drugs and always double check the ingredients. Always inform your doctor you are breastfeeding so any prescriptions can be adjusted accordingly. Birth Control Pills: If you've started taking birth control pills to prevent another pregnancy, it could be affecting your breast milk supply. Some forms of birth control contain estrogen, a hormone that can cause a decline in milk production. You can still use contraception while you're breastfeeding, but you should talk to your doctor about the types of birth control that are safe for breastfeeding mothers. Non-hormonal options such as the diaphragm, condoms, or the non-hormonal IUD, are good choices since they do not have hormones that can interfere with milk production. Progestin-only methods contain a small amount of hormone (synthetic progesterone), but they do not contain estrogen, so they are also a good choice for breastfeeding women. If your supply of breast milk is decreasing and you feel that one or more of the things included on this list could be contributing to it, then you can often increase your breast milk supply by trying to fix the problem. Taking care of yourself, trying to reduce stress or deal with stress in a healthier way, and making a few lifestyle changes can make a world of difference. Additionally, you can try to make more breast milk by breastfeeding or pumping more often. Of course, sometimes there are things that you can't change such as a new pregnancy or specific health problems. In those case, talk to your doctor and your baby's doctor. Most of the time, you can continue to breastfeed, but you may need to add a supplement to be sure your child is getting enough breast milk. Lawrence RA, Lawrence RM. Breastfeeding: A Guide For The Medical Profession. 8th ed. Philadelphia, PA: Elsevier Health Sciences; 2015. Reece-Stremtan S, Marinelli KA, Academy of Breastfeeding Medicine. ABM clinical protocol# 21: guidelines for breastfeeding and substance use or substance use disorder, revised 2015. Breastfeeding Medicine. 2015 Apr 1;10(3):135-41. Riordan J, Wambach K. Breastfeeding and Human Lactation. 4th ed. Sudbury, MA: Jones and Bartlett Learning; 2014. Sachs, H. C., Frattarelli, D. A., Galinkin, J. L., Green, T. P., Johnson, T., Neville, K., Paul, I.M., and Van den Anker, J. The Transfer of Drugs and Therapeutics Into Human Breast Milk: An Update on Selected Topics. 2013. Pediatrics; 132(3): e796-e809. Can Blessed Thistle Increase Breast Milk Production?